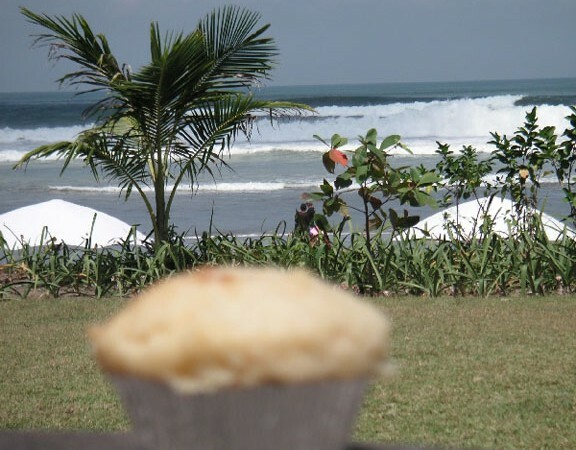 The new record for farthest-traveled muffin, was set in Summer 2006 by Doug Hogg who traveled to Bali and back to California with a pineapple coconut muffin which he named "Muffy." 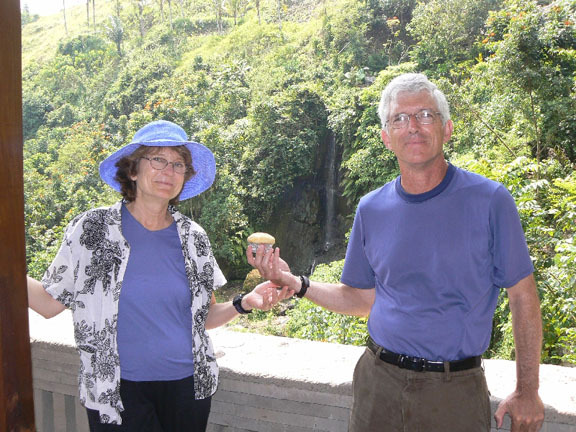 Using his creative talents and sense of humor, he photographed Muffy enjoying many tourist activities. Please read on to enjoy the narrative that Doug wrote to accompany his wonderful photos. 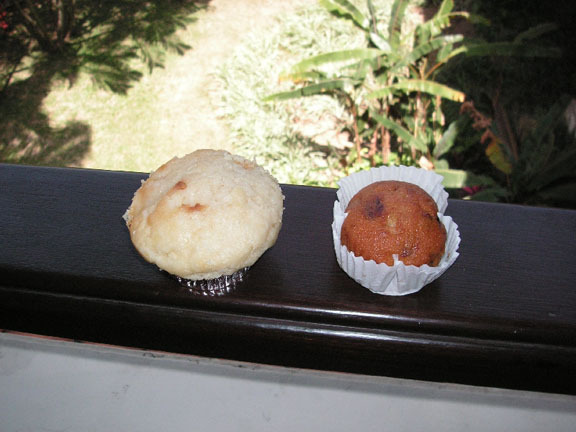 We invite you to send us photos of your Blue Skies muffins that have checked out with you and where they've traveled. We will post the "farthest traveled" on our website. Sally Thurston runs the Blue Skies Inn B&B in Manitou Springs, Colorado at the foot of Pikes Peak. 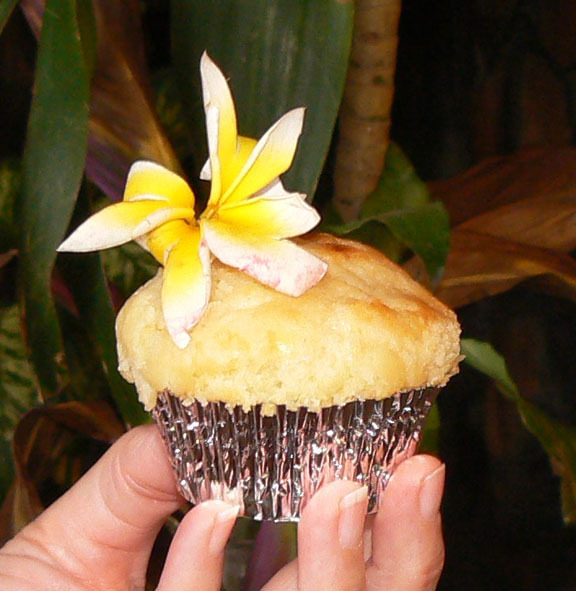 She makes world class muffins for breakfast. 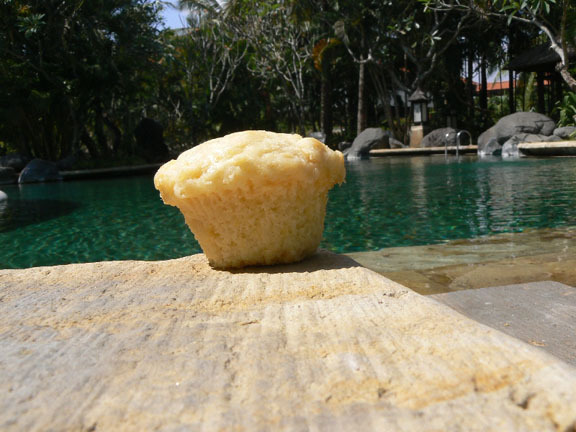 She does not get to travel very much but her muffins do. 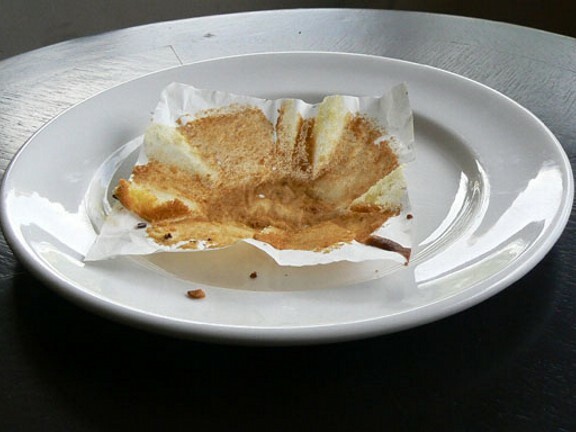 This is the story of the world (or part thereof) travels of one of her muffins. 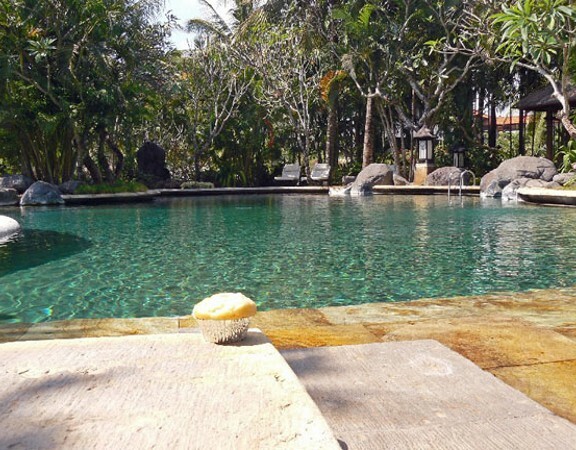 After a 36 hour trip, the first stop was the Sofitel Seminyak Bali. This hotel is right on the beach and has a wonderful pool which you can use if you get tired of the beach (and the hordes of hawkers). Muffy particularly liked the beach. The weather was perfect and it was very enjoyable. However it is not good for swimming because . of the surf. Muffy does not have a surfboard and so went to the swimming pool. There are two pools. One is mostly to be seen at while the other is for real swimming. The smaller pool is beautiful and private. Muffy inspects the pool but has forgotten to bring a swimsuit on the trip. The solution is easy, go skinny dipping. 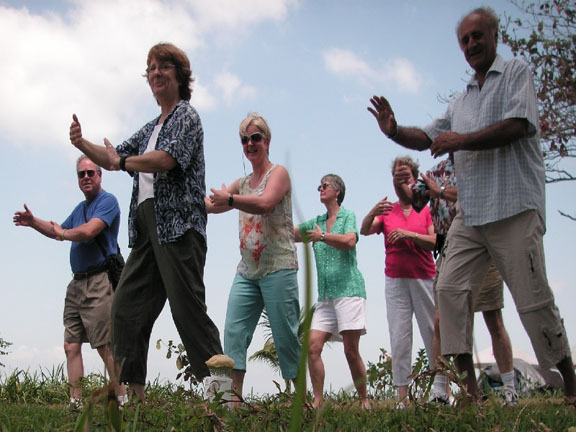 Another activity was Tai Chi lessons. Here muffy, down low in front, practices Tai Chi. Muffy made a new friend. The locals favor the loose flowing sarong. The sarongs are very nice in the warm weather. Muffy also like the sarong because it made her look taller. Muffy and another friend having breakfast together. The forks are a bit large but the hotel had spoons small enough for Muffy. 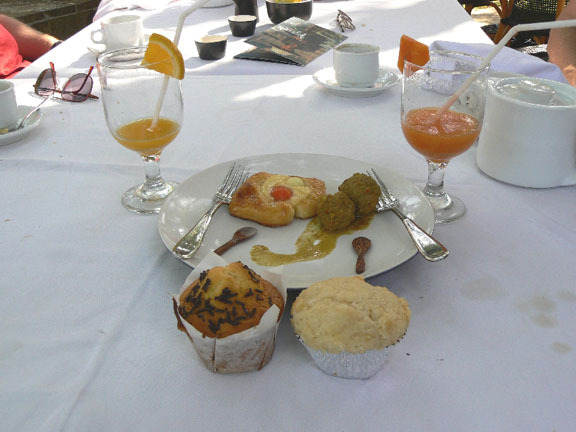 Unfortunately, during the breakfast, Muffy's new friend suddenly died. 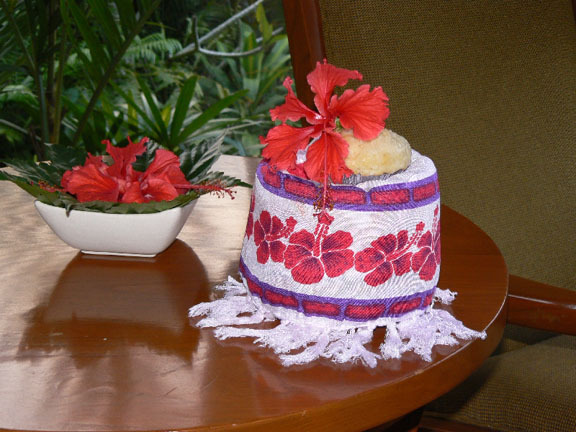 Muffy found out some information about the Balinese funeral habits. The bodies are cremated during elaborate ceremonies and the ashes scattered in the sea. 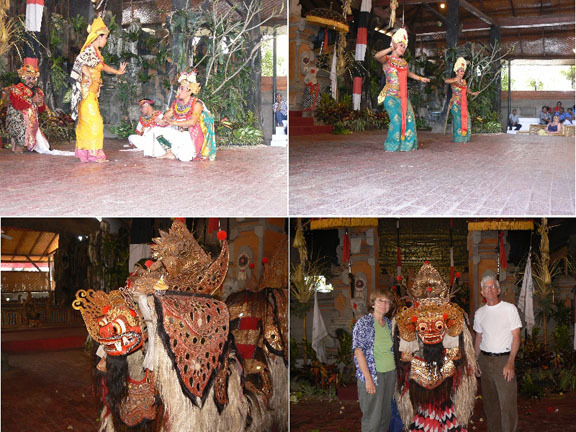 Bali is renown for its dancers. 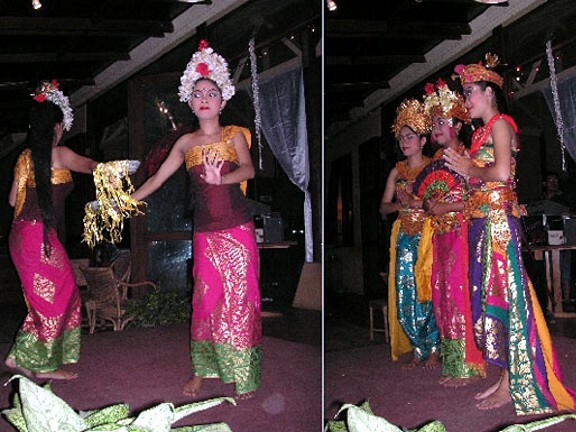 The three dancers below put on a show at a restaurant near our hotel. We went to see another dance show. This one had a well developed story which was very interesting if you had the program. The large Badong is a mythical beast which seems to show up a lot in the dance stories. Muffy enjoyed visiting with the Badong. Transportation is by motorbike for the most part. Rental of motorbikes can be as little as $1 per day. This is a particular good means of transport if you have a certain death wish. Muffy wanted to rent a scooter but did not bring along an international drivers license. 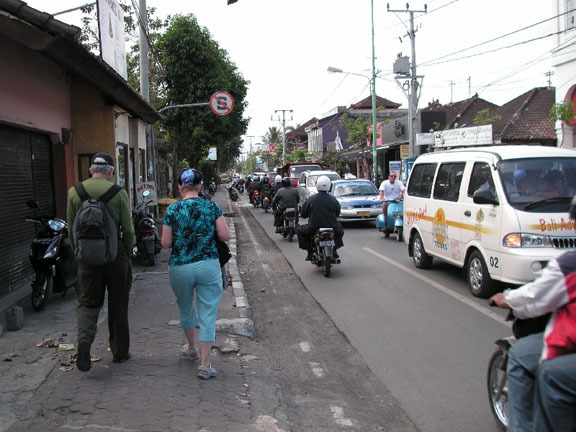 This is the main road in the Seminyak area. This is actually a fairly quiet time. 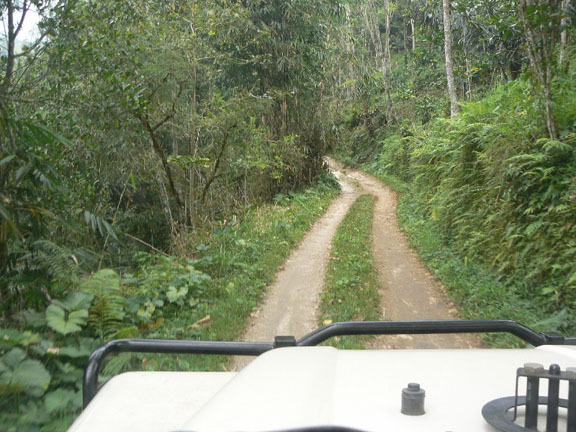 When you get to the countryside, there are roads which are much quieter. I think this is the busy time for this road. Dealing directly with the local businesses gives an idea of what fraction of the tourist dollars makes it to the locals. A day tour booked through our hotel would have been about $50. The same tour, booked through a local group, was $60 for 10 people. 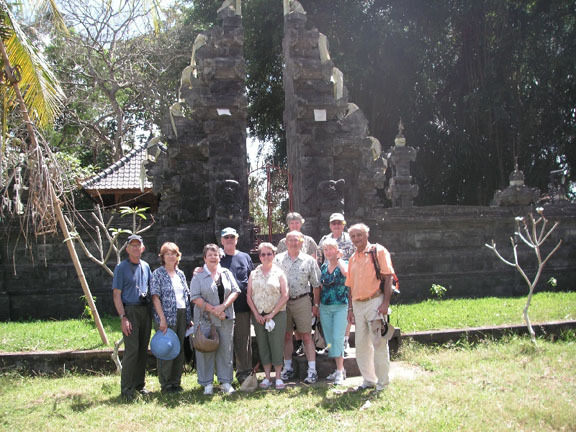 Here is the travel group in front of a Hindu temple. Muffy is not in the picture as someone had to take the picture. There are always temples in each village and in each home. Often there are small temples in front of businesses as well. Offerings are left on the high perch of the good gods to please them and offerings are left on the ground for bad gods so as to not displease them. 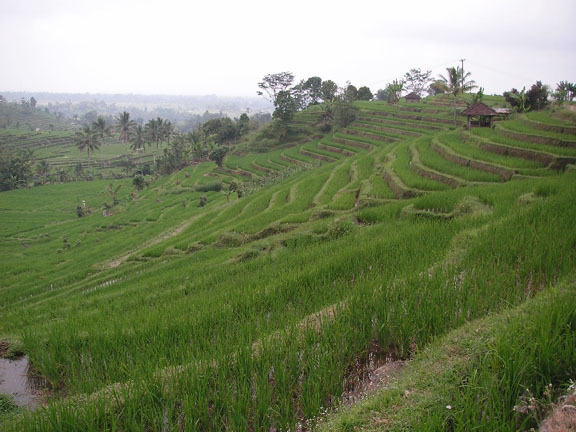 Rice is the main crop and the fields it takes a lot of work to grow the rice. All available land is used so even hillsides must be worked. 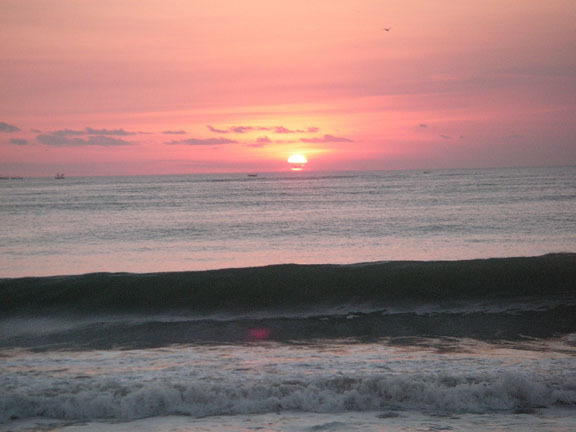 Jimbaran beach is known for its sunsets and so there are lots of restaurants on the beach for watching the sunsets. When I say on the beach, that means on the sand. 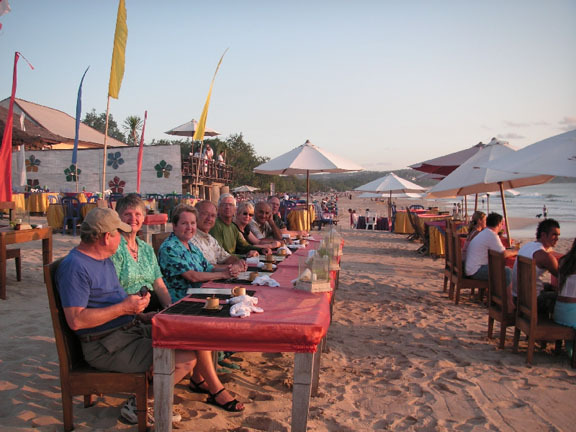 Notice the specially designed beach chairs which got shorter as the evening wore on. At this restaurant, you chose your victim for dinner from a tank. I prefer food in packages. Muffy was not a fish fan in any case. The sunset was very nice that evening. 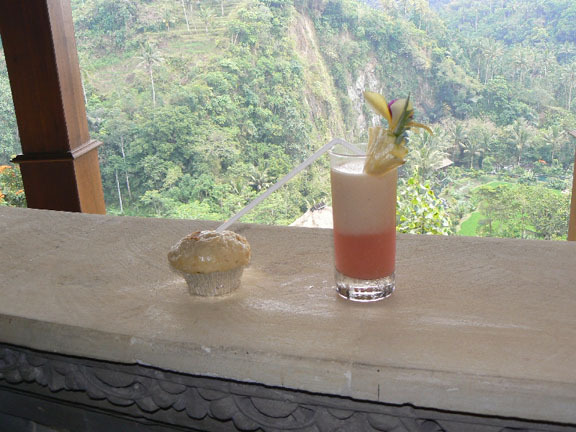 The second hotel was the Royal Pita Maha near Ubud in the center of Bali. Below Muffy enjoys a welcoming drink in the lobby of the hotel. At this hotel, and others, there are no windows or doorways. The roof overhang protects from the direct sun and rain but the temperature is always pleasant enough that an open area is comfortable. Muffy had a private villa with its own pool. 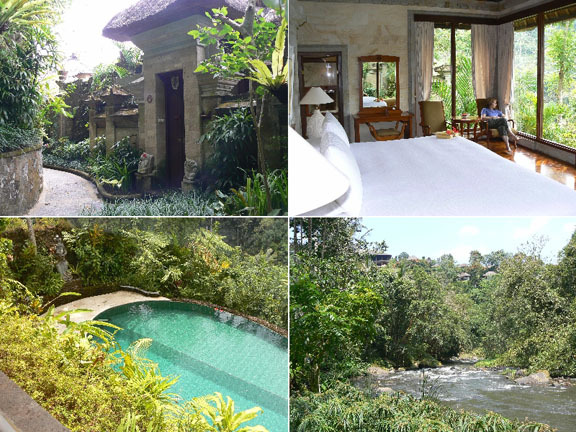 The pictures below show the entrance to the villa, a view of the main room (there was also a sitting room), the view down to the private swimming pool and a view of the villa from the lower part of the hotel complex. Muffy's villa is just below the ridge above the right side of the river. 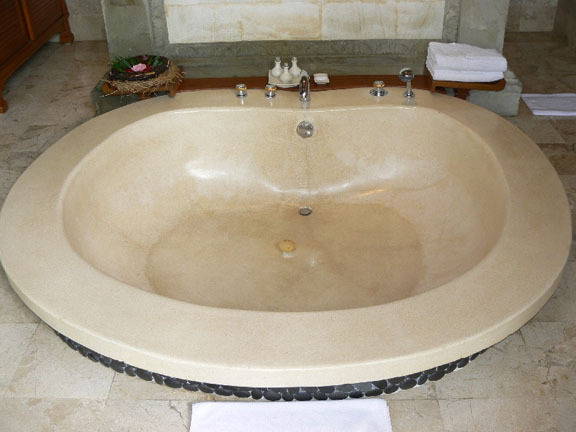 Muffy was unable to use the tub as she could not reach the faucet. As part of the entertainment, we went hunting. 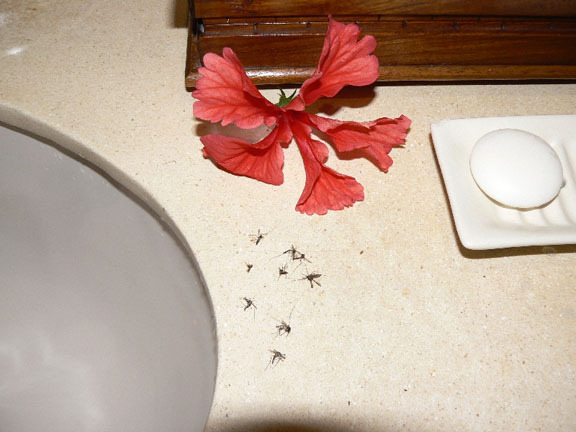 In ten minutes we had gotten a number of mosquitos. After hunting, we were hungry and went to dinner. When we got back, the mosquitos were gone. The resort property was large enough (the street was over half a mile from the lobby) and beautiful enough that there was little need to leave the grounds. Here Muffy and friends look at a waterfall on part of the property. This picture was taken at the top of an elevator which goes to the lower part of the hotel. The main part of the resort is on a hillside. There is always the option of 150 stairs. 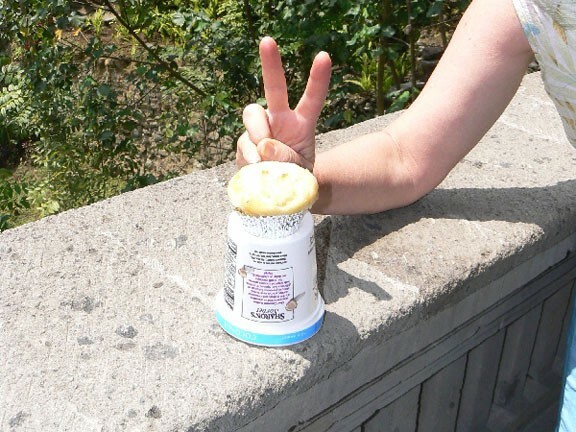 Whenever you take a picture, there is always someone around doing this. The last stop was in Singapore. 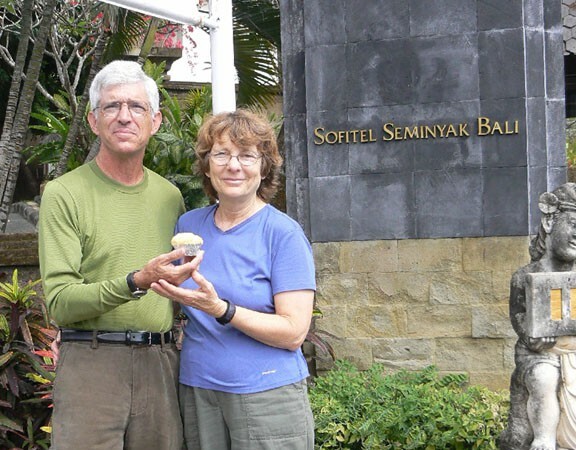 Bali is a third world country but Singapore is definitely a first world country. This was the view from our hotel window. 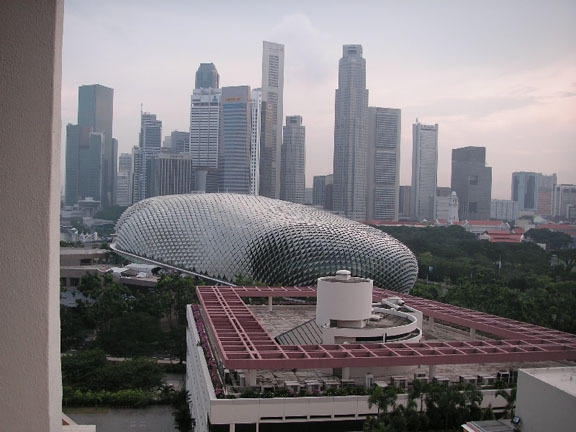 The prickly looking building in the foreground (it resembles a Durian. More on that below) is a theatre for performing arts. The red roofs behind the trees on the right are the old government buildings and some shops across the Singapore river (length about one mile). Singapore is constantly changing. There is so much change that it is hard to keep up with it. 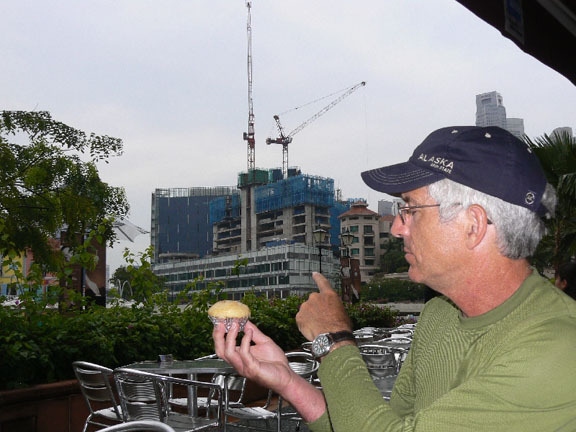 Here Muffy looks at the national bird of Singapore, the crane. Singapore has a very nice botanic garden. 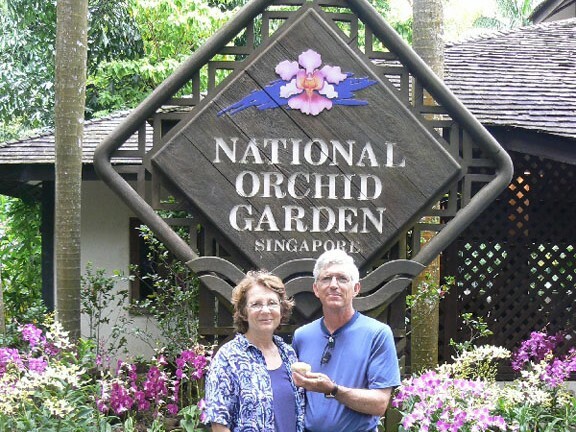 The main feature is the National Orchid Garden which has about 50,000 blooms at any given time. Muffy did not try to count them. There is a lot of good food in Singapore. Muffy liked eating at the food courts with the locals but, on occasion, liked more familiar food. 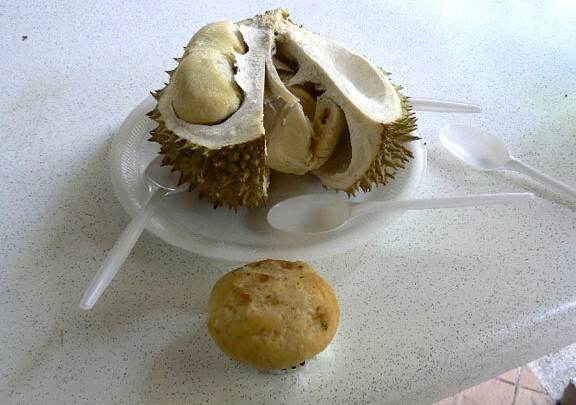 The fruit below is a durian. Muffy inspects it but is not sure what to make of it. It comes from Thailand and is considered a great delicacy. 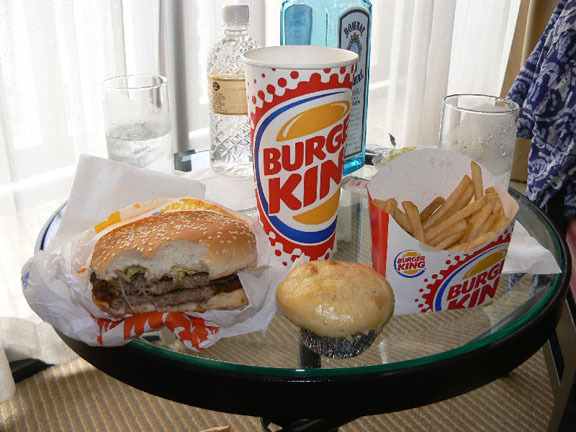 However, you cannot take them on the subway, in taxis or in your hotel room. The reason for this is the smell. 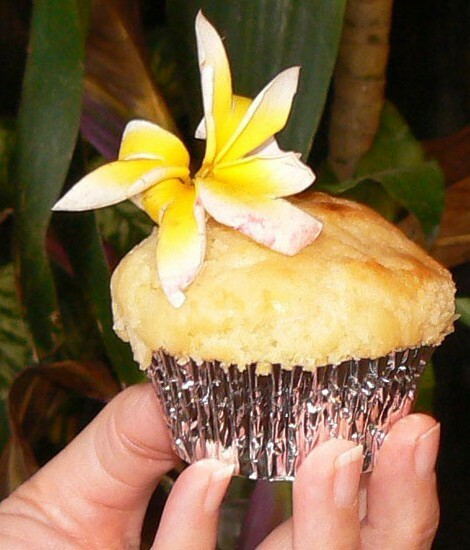 They have been described as like eating a fine custard in an outhouse. I think it is an acquired taste. There are many strange animals in Singapore. 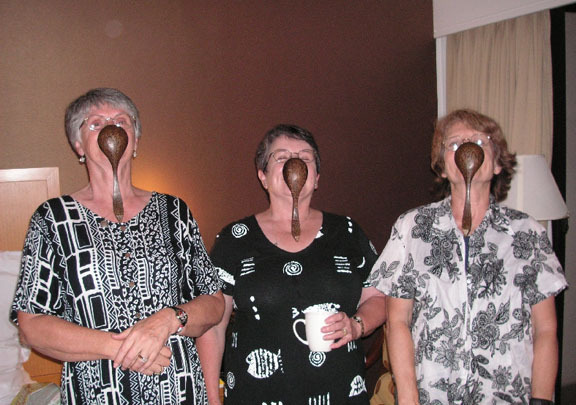 Someone noticed that it was possible to set one of the carved wooden spoons in ones nose and have it stay there. Muffy could not get the hang of it. Muffy back at home. It was a long trip and was hard on Muffy. She had many fond memories of her voyage. 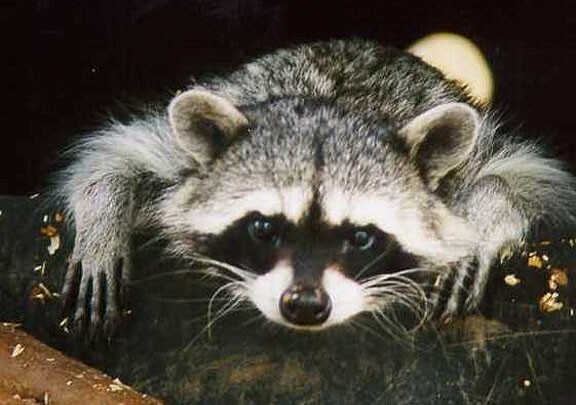 Unfortunately, that night there was an encounter with a Raccoon and Muffy has not been seen since.